Updated (January 4) to reflect service status of the #73 Carondelet, #61 Chambers and #75 Lilac-Hanley. Some MetroBus routes as well as a Park-Ride lot in Eureka are providing normal service at this time as nearby rivers recede. However, a few MetroBus routes in the bi-state region are still on reroute due to weather conditions. The #40X I-55 Express and the #410X Eureka Express have resumed normal service. Both routes were unable to service parts of their routes due to road closures caused by nearby flooding. The Highway 141 Park-Ride lot, which serves the #210 Fenton Gravois Bluffs and the #410X Eureka Express, has reopened and is providing regular MetroBus service at this time. The #61 Chambers and #75 Lilac-Hanley have resumed their routes at this time. The routes were rerouted due to flooding. The #73 Carondelet has resumed its normal route. The bus route was rerouted due to flooding as Alabama was closed over the River Des Peres. 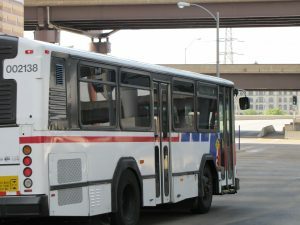 More information on MetroBus reroutes due to flooding can be found in Rider Alerts on metrostlouis.org. When will the new bus route38 that will be servicing Center For Life Solutions that is moving over by Pershall or Ford Lane schedule be made available? Will I catch it at the Hanley Station Metrolink or where. My phoned number is (314)200-9888. Any help would be much appreciated. James, we anticipate new MetroBus routes will come online during the next quarterly service change on March 14, 2016. Metro’s Planning Department will be out in the community some time in February to discuss specifics about routes and additional MetroBus service in North St. Louis County. We’ll publish a blog here (as well as additional communication) when details of the community events are finalized.